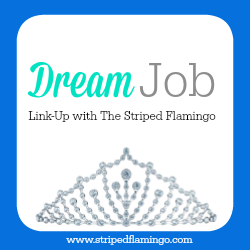 The Striped Flamingo: Don't Forget to Link Up Tomorrow! Don't forget to link up your dream job posts tomorrow. This is me, getting down on my hands and knees and begging you to link up with me. Pretty, pretty please with cherries, hot fudge and rainbow sprinkles on top?? Read more about the link-up here.